We just finished a fun tournament in St. George. 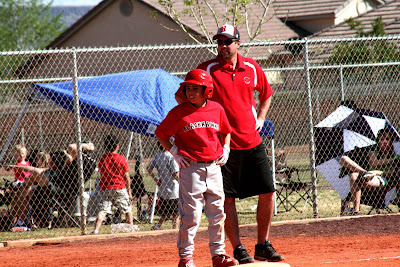 Sam's team, coached by Craig, won two games and lost two games--not bad for their first season tournament together. Many of the kids on the team this year are new and it always takes awhile for the kids to play as a team, so we were pretty happy with the outcome. We very nearly finished with 3 wins and 1 loss, losing a close extra innings game on the first day. 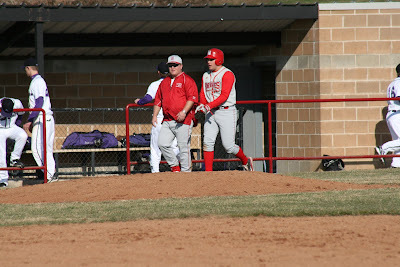 I love this picture of Sam and Craig at third base. Sam hit a double and then advanced to third where he and Craig were apparently scoping out the field in exactly the same manner. We took Isaac to the doctor (AGAIN!). She did some skin tests for allergies and said it was definitely a walnut that got us on Craig's birthday. So now Icky is off ALL nuts. We have also added kiwi fruit and salmon (this one is making us all, especially Isaac, really sad) to the list of allergic foods. One piece of good news is that the rice, wheat and coconut tests came back negative, so we can keep eating these . . . for the time being. Icky also has to take an anti-histamine if he is going to be active to avoid hives on his legs from "exercise-induced allergies" (I will admit he got this one from me). Food allergies stink! 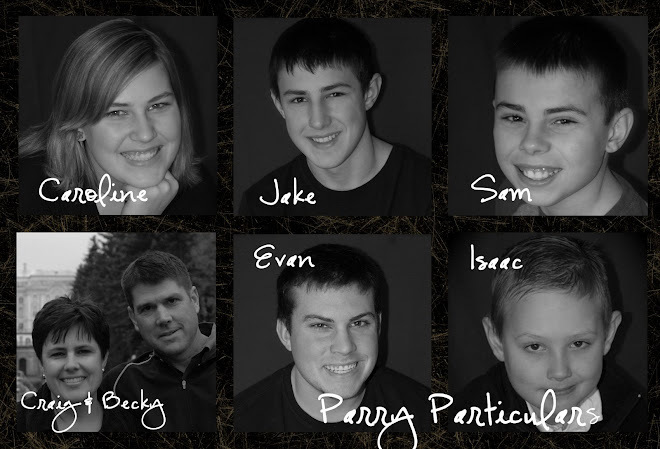 This was a very eventful week for the Parrys! In fact, lots of weeks are eventful but this one may have topped the rest. Baseball is in full swing (pardon the pun). The high school started region play this week and are now 2-0--a great start. 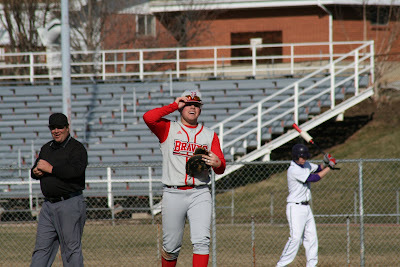 Evan is playing varsity, batting clean-up and starting at first base. He had an amazing week. 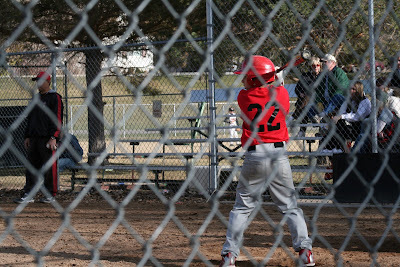 He hit a double in the first varsity game and a home run and a double in the JV game the same day. 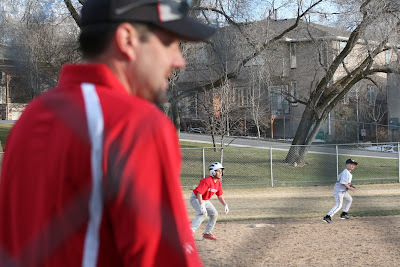 On his birthday he hit a long, long ball in the varsity game which went over the left field fence for a home run, but at the last second the left-fielder reached over the fence and caught it, robbing Evan of a home run on his birthday. Mom is still fuming. 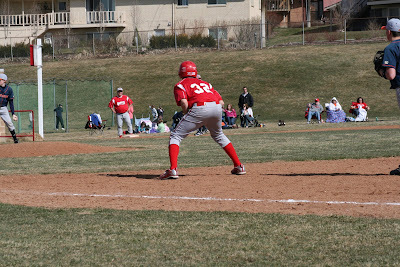 Jake played in his first game on Saturday, a sophomore double-header against Mountain Crest. His position has changed from infield to left field, so he was a little nervous, hoping at times that no one would hit to left field. He missed making an A-mazing catch by inches, but did everything right and fielded three other ground balls cleanly and threw them in. At the plate he popped out his first high school at-bat and then walked twice. 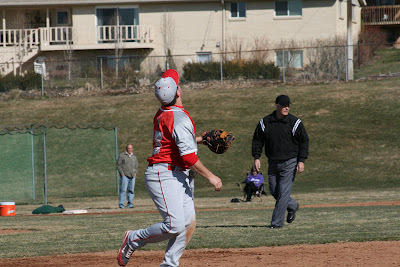 Bountiful won in three extra innings. He was so tired after his long day that he went to bed at 9:30 on a Saturday night. Sam had three scrimmages and played great. 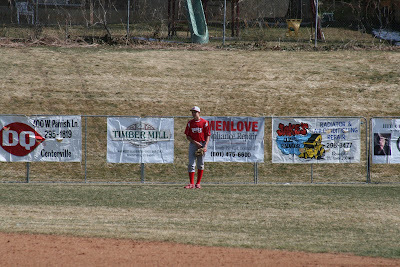 He pitched, played center field (making an exciting diving catch) and was productive at the plate going 5-for-6. You can see from the picture that he has an awesome coach. Thursday was Craig's birthday and an exciting baseball game at the high school, but it was also the BAD DAY. 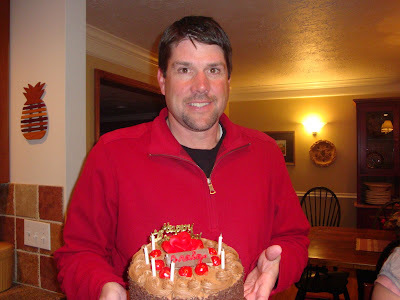 I got Craig a beautiful German chocolate cake from a bakery in Salt Lake City. I was trying to make his birthday really special because with Evan's the next day, it never really is. Craig always tells me to just get Evan a cake and skip one for him. So I went the extra mile. After Evan & Jake's games we went to eat at El Matador then we went home for cake. It was delicious. Isaac thought so too until he said he thought the cake was making him sick. Then he vomited like I've never seen before (I've seen him vomit probably hundreds of times). Then his lips and tongue got really swollen and his throat felt "strange". It was at this point that Craig made the 911 call and I gave Icky a shot of epinephrine. It was scary and Isaac and I were both crying. 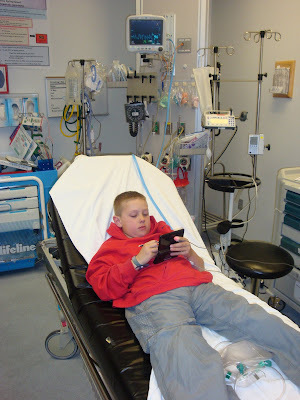 The paramedics took us to Primary Children's and we had to spend the night. We're not sure if it was a stray peanut in the cake or the German chocolate filling which contained walnuts and coconut. We hope we'll find out on Tuesday. We're thinking about having Isaac live in a bubble. 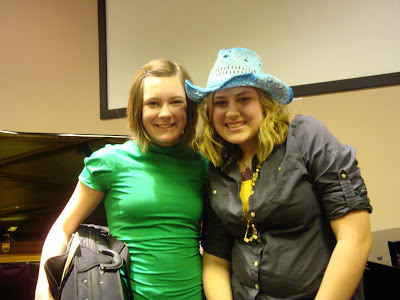 That was our exciting week. Here's to many more (except the last part). Sam and Craig had a fabulous, warm weekend in Phoenix watching MLB spring training games. Sam's team, which Craig coaches, also participated in a tournament where they played on replica MLB fields (the Polo Grounds and Yankee Stadium). Sam's team didn't play their best, but they still had a great time. 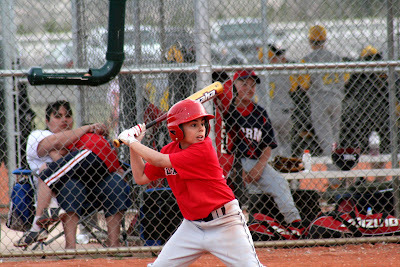 Sam had the "game of his life" on Friday, hitting three line drives to center field and playing great defense. 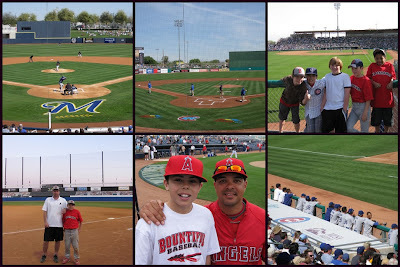 They were able to see the Cubs, Brewers, Angels, Dodgers and the Mariners play spring training games. It was a dream come true for Sam (and maybe for Craig too). The rest of us had to endure cold and snow (and no baseball other than the World Baseball Classic). So, I know people think baseball rules our lives and it probably does. We practice it all the time, we spend tons of money on it and we love to talk about it. Each boy in our family is an amazing baseball player and Caroline can hold her own in softball. I love it. 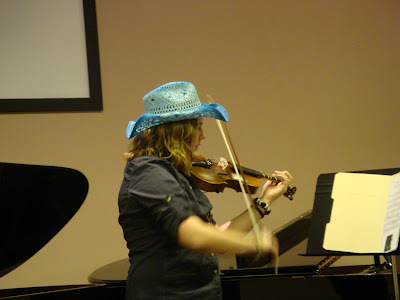 I love to go to games and see the results of the many hours of practice. 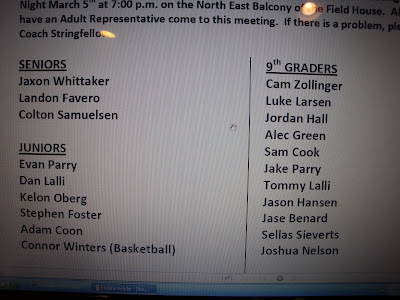 But I'm not gonna lie, I was nervous yesterday before the high school team was announced. Logically, I knew that Jake and Evan both deserved to make the team, but there are always surprises (yesterday a solid senior was cut for who knows what reason). Anyway, I had to occupy myself all morning until noon when the names were posted. Craig called at 11:30 and his voice sounded funny so I assumed the worst. . . . But actually Jake and Evan both made it just like we thought they should and it will be so fun for them to play with each other for these two years before Evan graduates. Other than their Varsity, JV and Sophomore games, Caroline is playing softball this spring, Sam is playing on two teams and Icky is playing on two teams. I should probably go rest up for spring now.